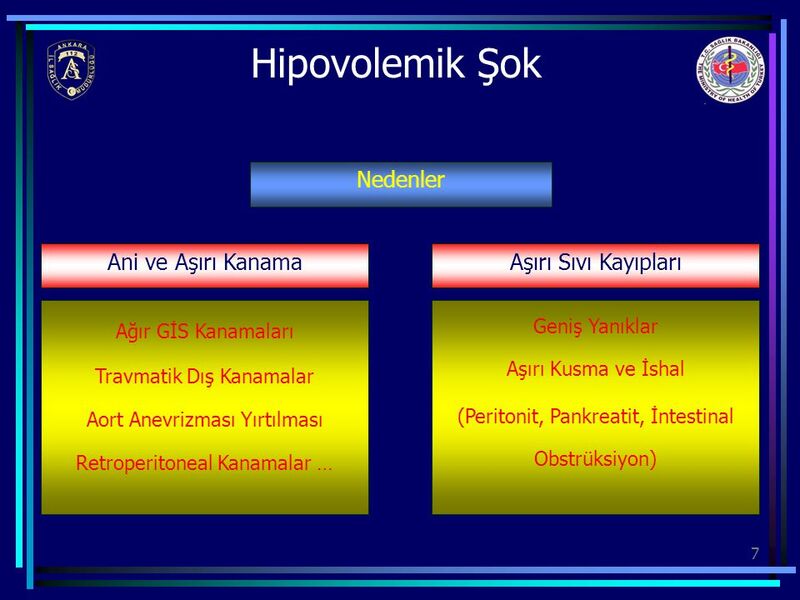 12 Sıvı Tedavisi Hangi Hastaya ? 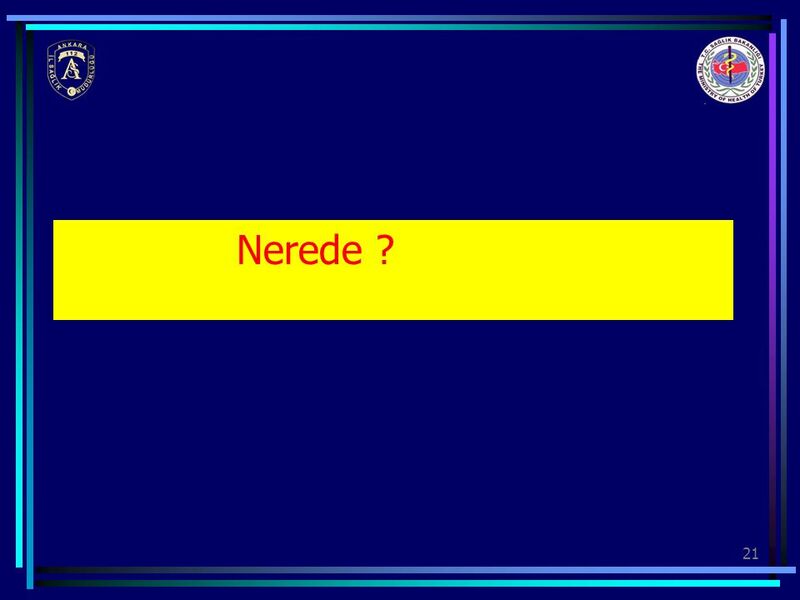 Nerede ? 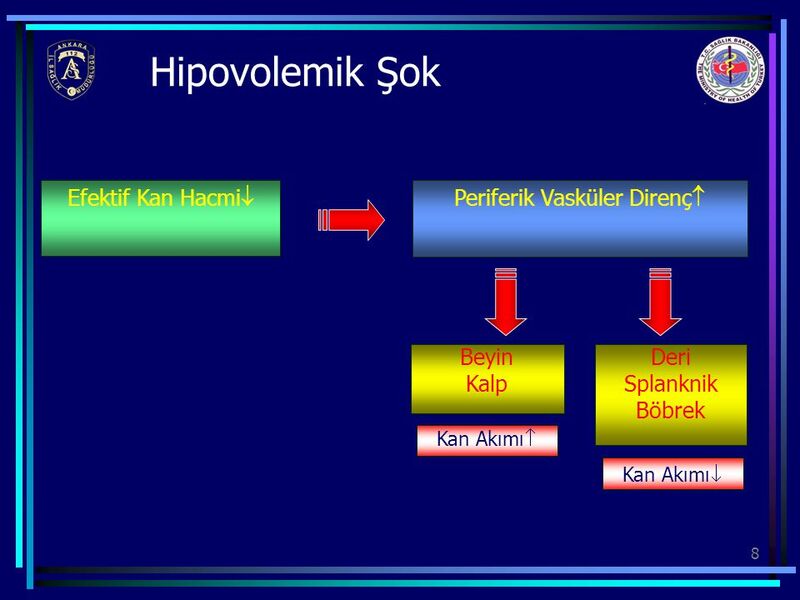 Hangi Yolla ? 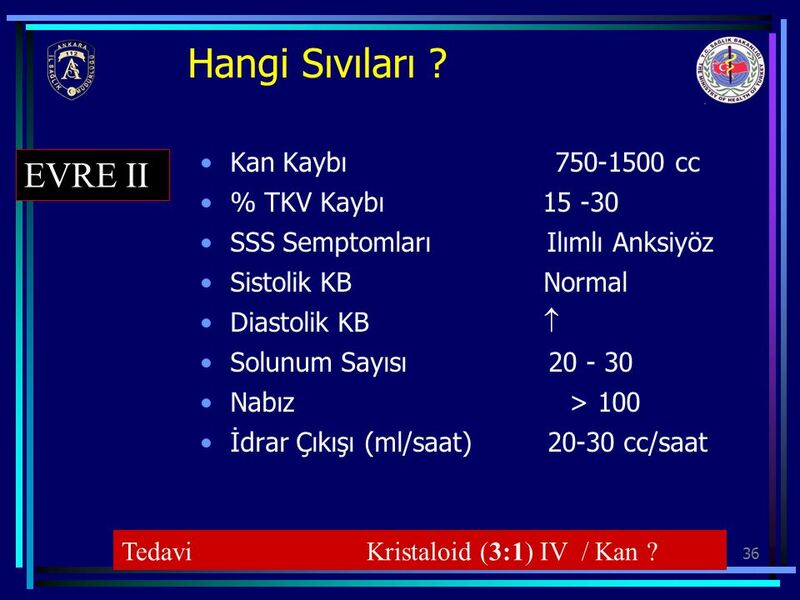 Hangi Sıvıları ? Ne Zamana Kadar? 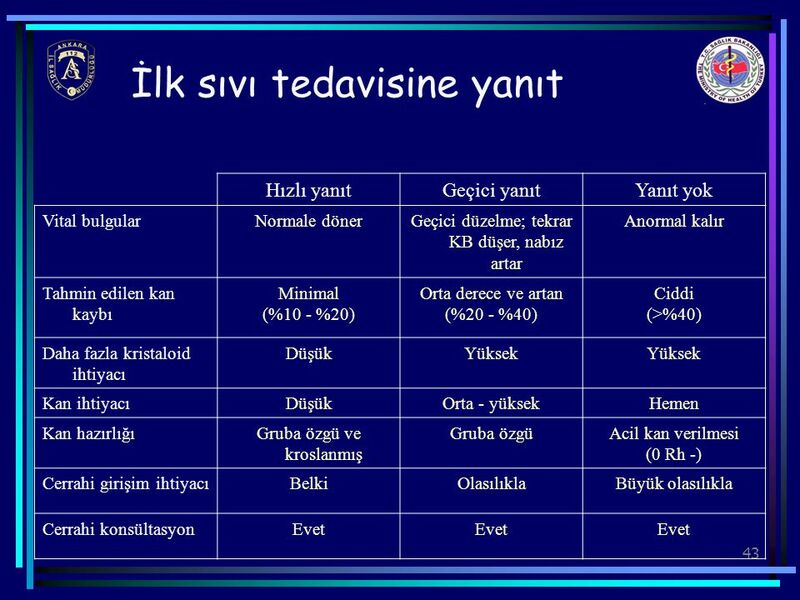 Gelecek ? 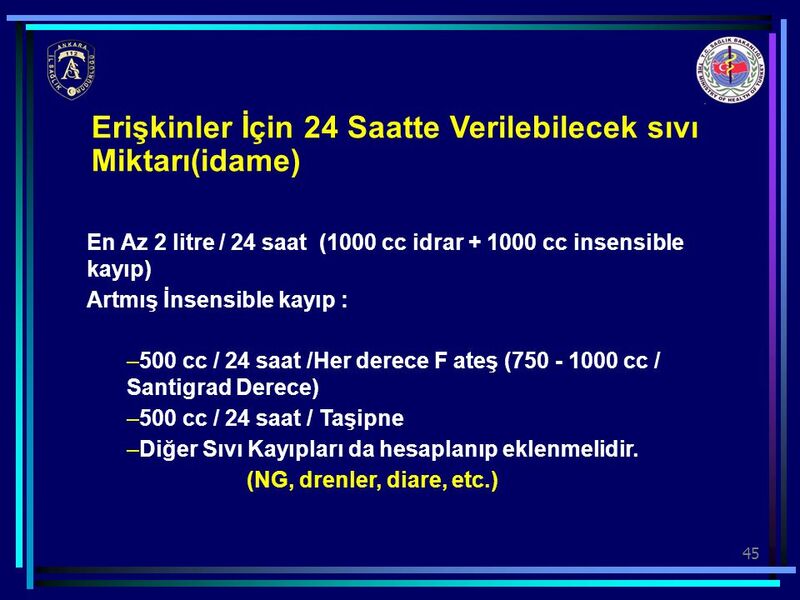 İnternal veya Kontrol Edilemeyen Bir Kanama Varsa Hasta Hızla Değerlendirmeli ve Kesin Cerrahi İçin Sevk Edilmelidir. 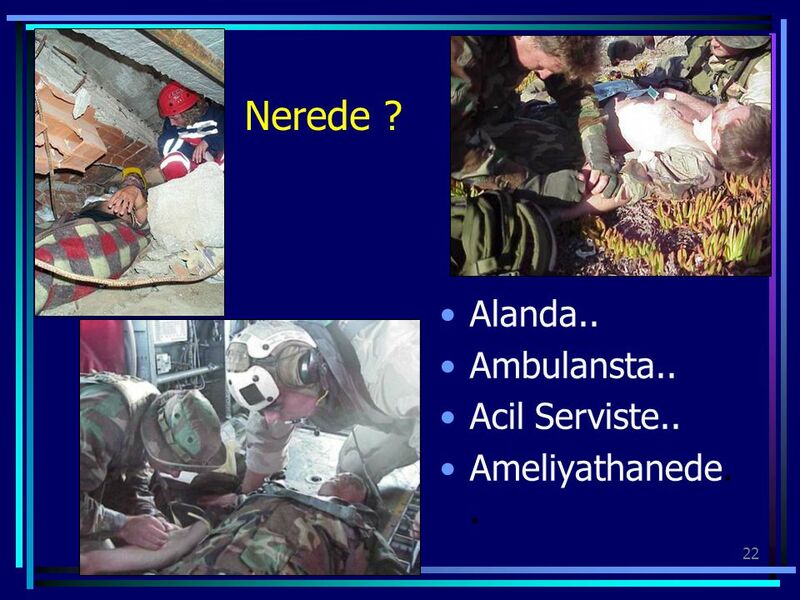 22 Nerede ? 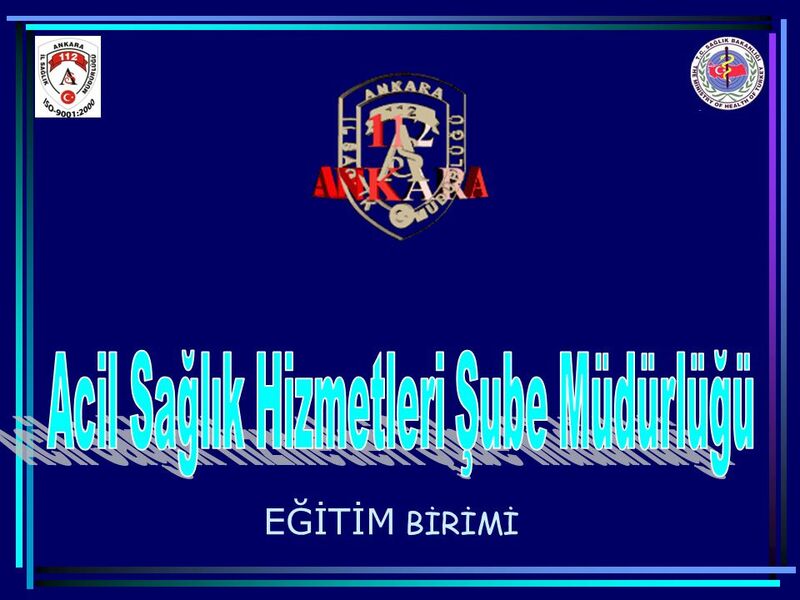 Alanda.. Ambulansta.. Acil Serviste.. Ameliyathanede.. 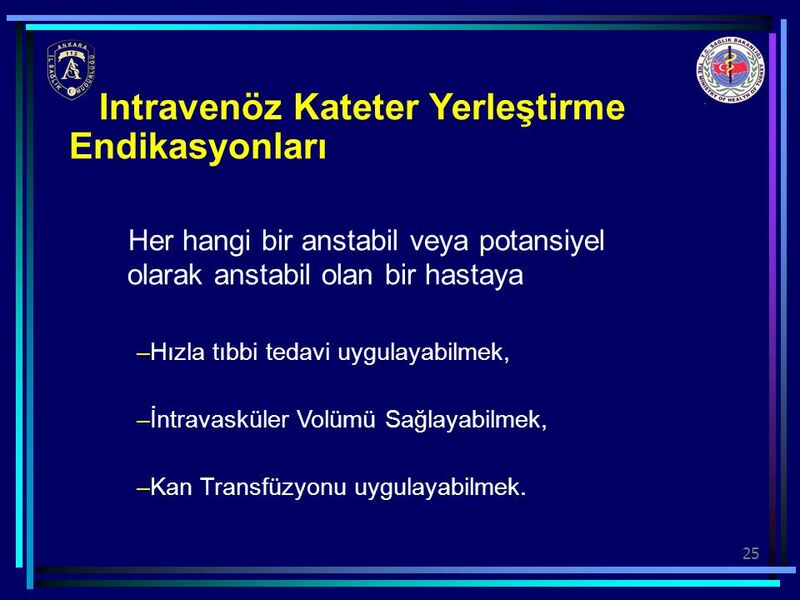 Her hangi bir anstabil veya potansiyel olarak anstabil olan bir hastaya Hızla tıbbi tedavi uygulayabilmek, İntravasküler Volümü Sağlayabilmek, Kan Transfüzyonu uygulayabilmek. 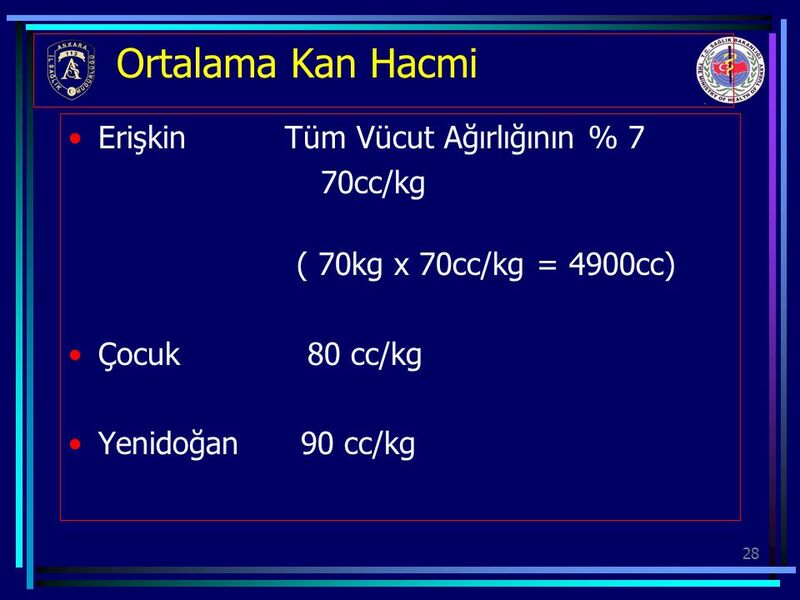 ( 70kg x 70cc/kg = 4900cc) Çocuk cc/kg Yenidoğan cc/kg If your going to resuscitate someone for hemorrhagic it’s go to be able to estimate their normal blood volume. 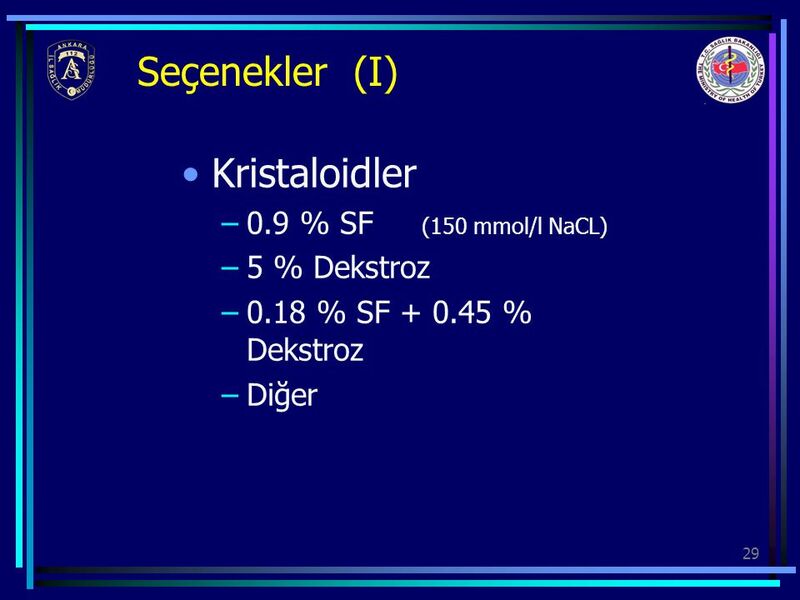 0.18 % SF % Dekstroz Diğer Therapeutic fluids that we prescribe for intravenous administration, can be divided into 2 basic types. Crystalloids are simple solutions of small solutes, whilst colloids are suspensions of macromolecules, or in the case of blood, cells. The most commonly used crystalloids are saline and dextrose, where the dissolved solutes are sodium-chloride and glucose respectively. 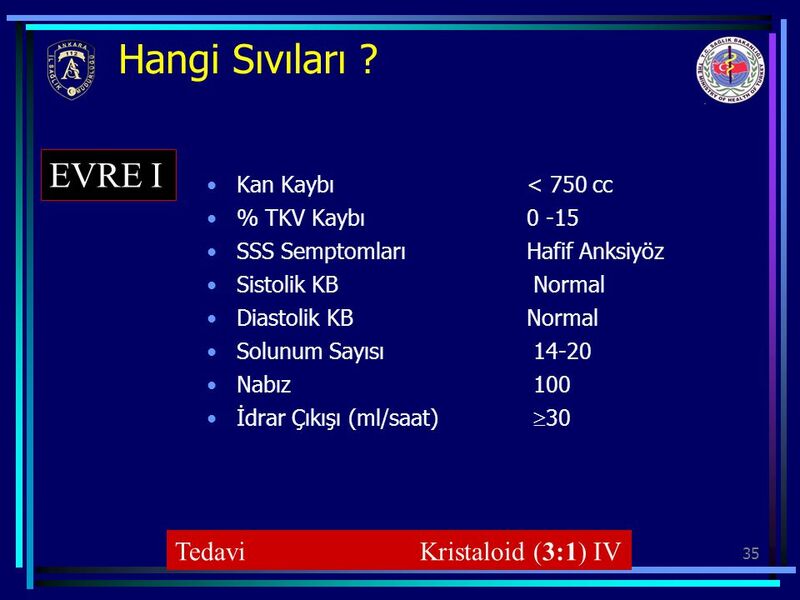 The standard saline solution is 0.9% saline, often referred to as " normal saline ", which contains 150 mmol/l of NaCl, and is therefore not normal, being slightly hypertonic, and hypernatraemic. Dextrose is usually given as 5% dextrose, which means that it contains 5 grams of glucose per 100 ml of water. This solution is roughly isotonic to serum, but the glucose is rapidly utilised, leaving behind pure water. A host of other crystalloids exist and are beyond the scope of these notes. Multiple colloid preparations are available, but the essential ones are either natural, such as blood, human albumin or plasma, or synthetic, where the macromolecule is manufactured. Common synthetic colloids are " haemaccel "and " gelofusine ", in which hydrolysed gelatin is suspended in saline. 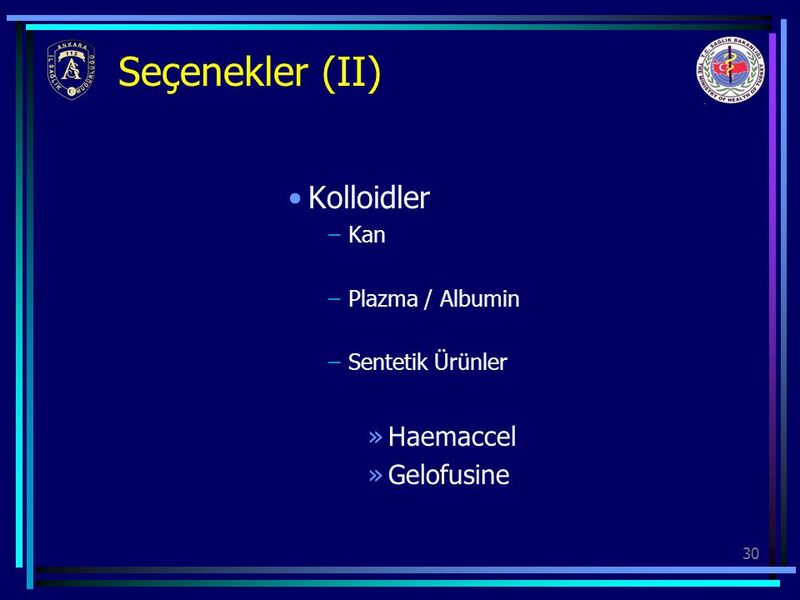 Sentetik Ürünler Haemaccel Gelofusine Therapeutic fluids that we prescribe for intravenous administration, can be divided into 2 basic types. 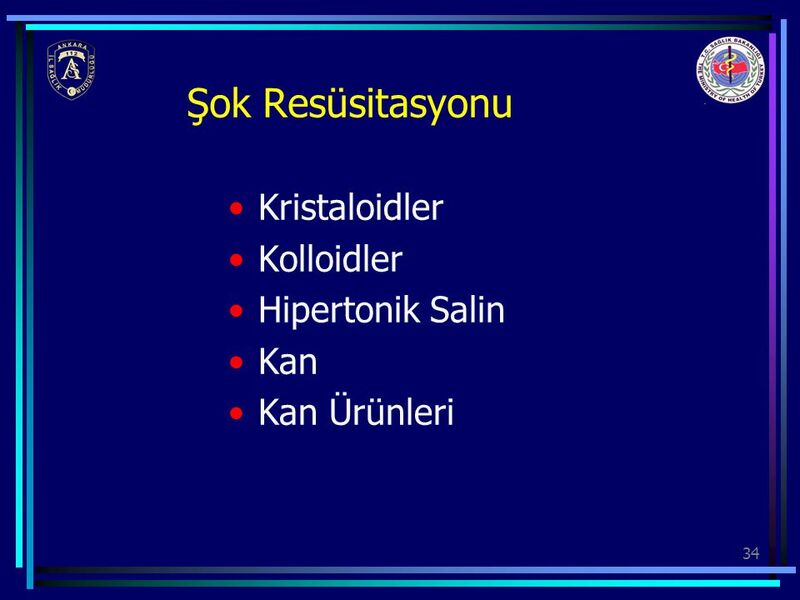 Crystalloids are simple solutions of small solutes, whilst colloids are suspensions of macromolecules, or in the case of blood, cells. The most commonly used crystalloids are saline and dextrose, where the dissolved solutes are sodium-chloride and glucose respectively. 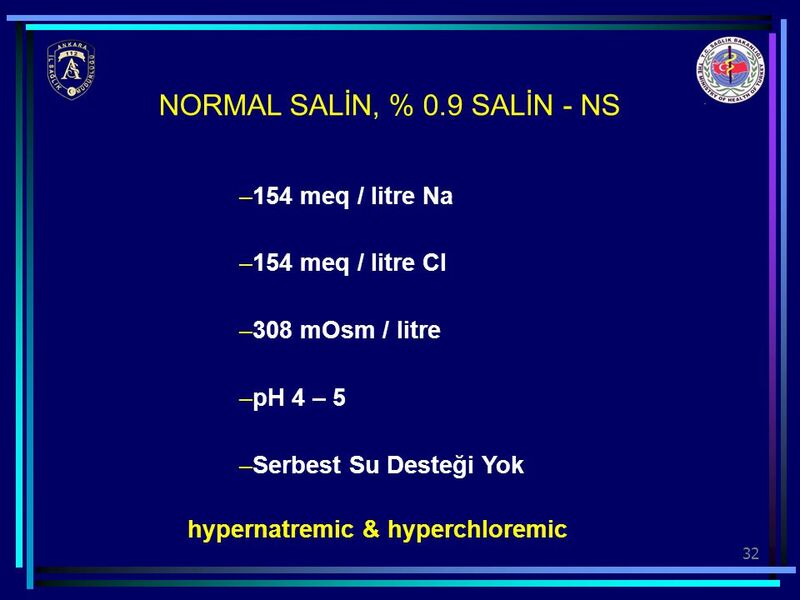 The standard saline solution is 0.9% saline, often referred to as " normal saline ", which contains 150 mmol/l of NaCl, and is therefore not normal, being slightly hypertonic, and hypernatraemic. 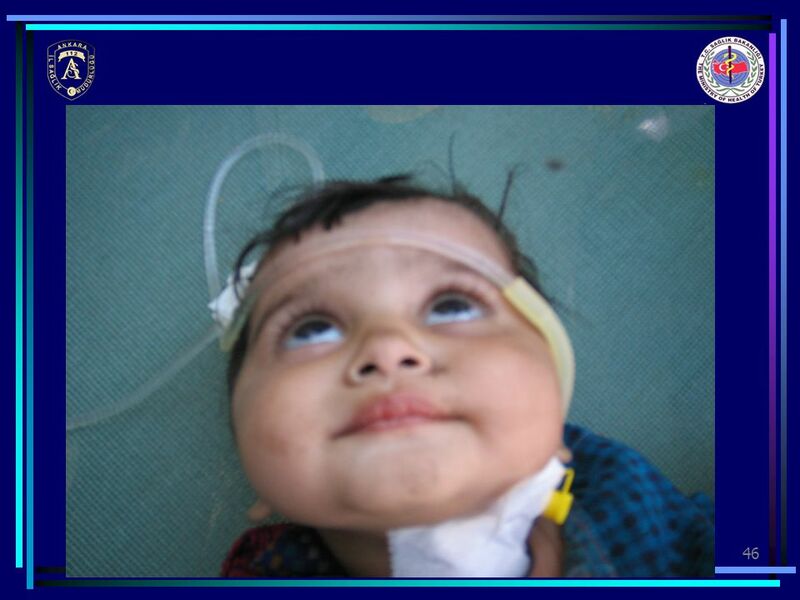 Dextrose is usually given as 5% dextrose, which means that it contains 5 grams of glucose per 100 ml of water. 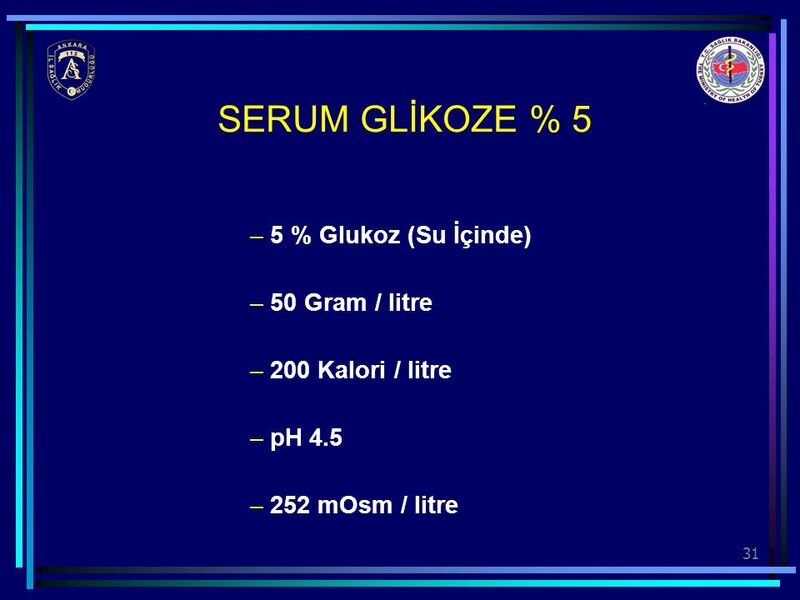 This solution is roughly isotonic to serum, but the glucose is rapidly utilised, leaving behind pure water. A host of other crystalloids exist and are beyond the scope of these notes. Multiple colloid preparations are available, but the essential ones are either natural, such as blood, human albumin or plasma, or synthetic, where the macromolecule is manufactured. Common synthetic colloids are " haemaccel "and " gelofusine ", in which hydrolysed gelatin is suspended in saline. 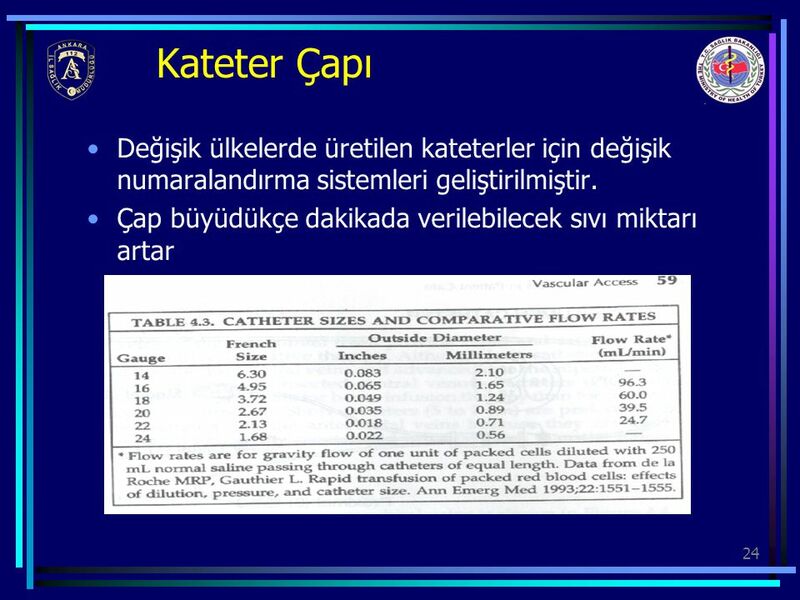 Kan Ürünleri Most of this talk will be about resuscitation, and I'll also talk about the resuscitation fluid that we have in the field which the Air Force is currently carrying with the mobile field surgical team, and I'll also talk briefly about some of the new blood substitutes that we're looking at. One is in a clinical trial here. 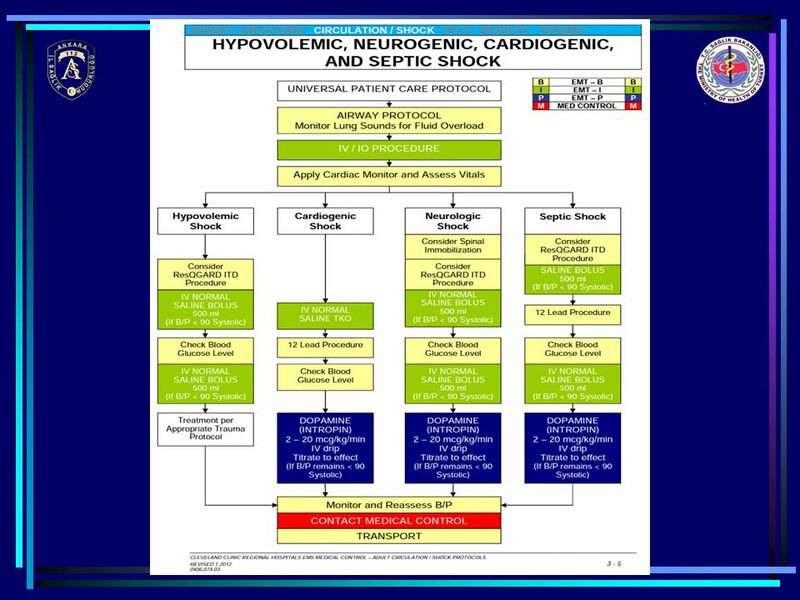 There are a couple out there -- one has already been taken off the market for an increased mortality in some patients -- and so we'll talk a little bit about those and where we're going with those, and some of these things that you don't use in your daily setting and we don't use here (hypertonic saline), but they're perfectly safe. It's a smaller volume to carry into the forward environment, and they can be used and have been used in shock before. 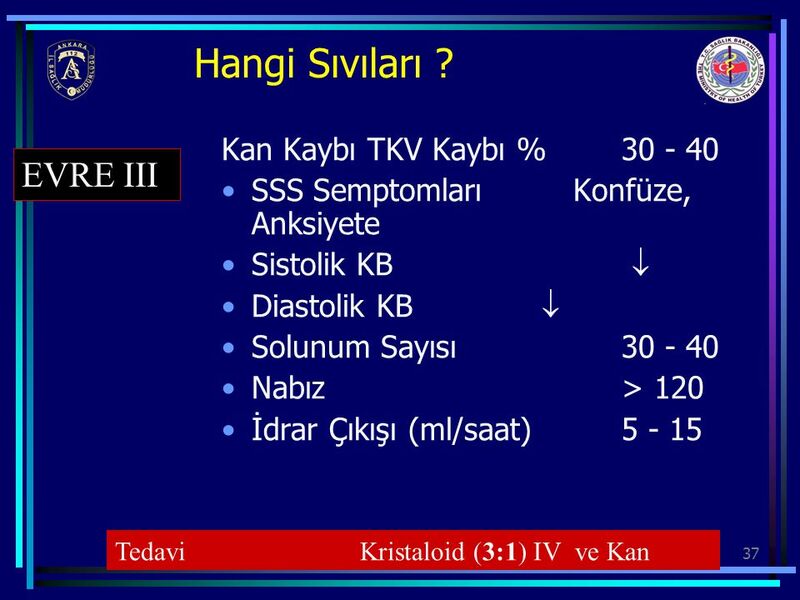 SSS Semptomları Ilımlı Anksiyöz Sistolik KB Normal Diastolik KB  Solunum Sayısı Nabız > 100 İdrar Çıkışı (ml/saat) cc/saat EVRE II Tedavi Kristaloid (3:1) IV / Kan ? 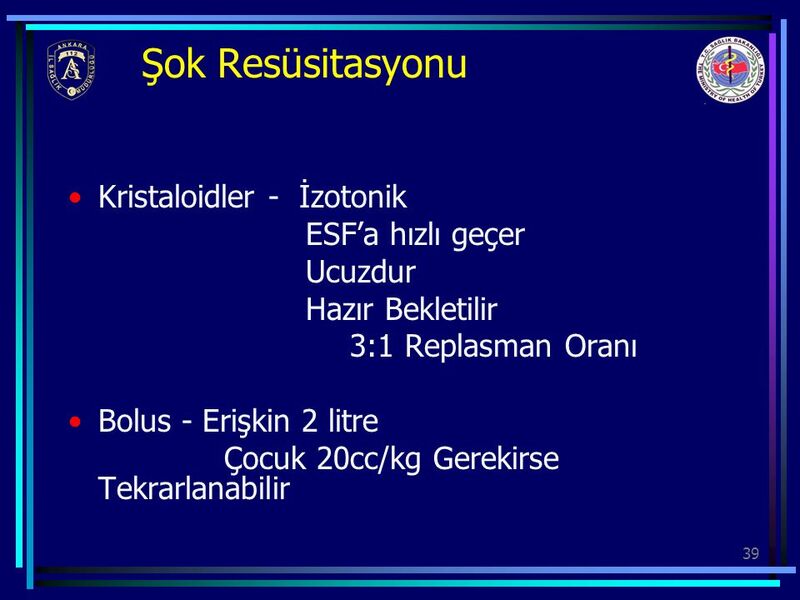 Hazır Bekletilir 3:1 Replasman Oranı Bolus - Erişkin 2 litre Çocuk 20cc/kg Gerekirse Tekrarlanabilir Crystalloids are kind of gold standard in a big hospital. They're isotonic, and they rapidly equilibrate with your extra-cellular fluid volume. How rapid? Well, after an hour, only about a third of that LR is still in the vascular space, and so the reason you're not catching up is, you're not giving it fast enough, and enough, with these patients who are in class III shock. When they are in shock, the rate of the equilibration is even faster because of a lot of capillary leaks in a bunch of organ systems, and so it's a good fluid, it's inexpensive, it's readily available, and that's why we have this three-to-one replacement ratio that the anesthesiologists came up with, for the most part, is that for every blood loss amount of a liter you should expect at least 3 liters of saline or LR to be required, but you'll find that it's probably even higher than that in a trauma setting. 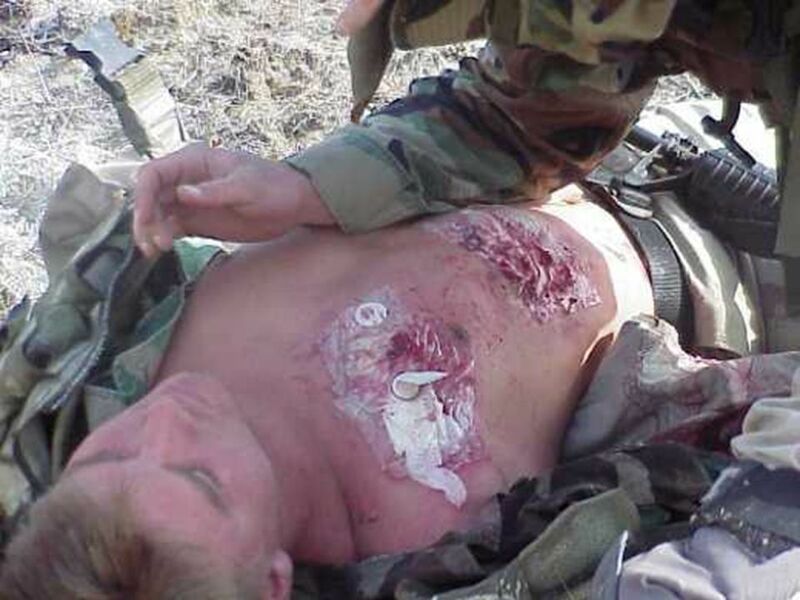 This is a general elective case where it tends to work out with the blood loss. Again, for adults we still bolus 2 liters if they're hypotensive here. I would be happy to talk at the end more about this. 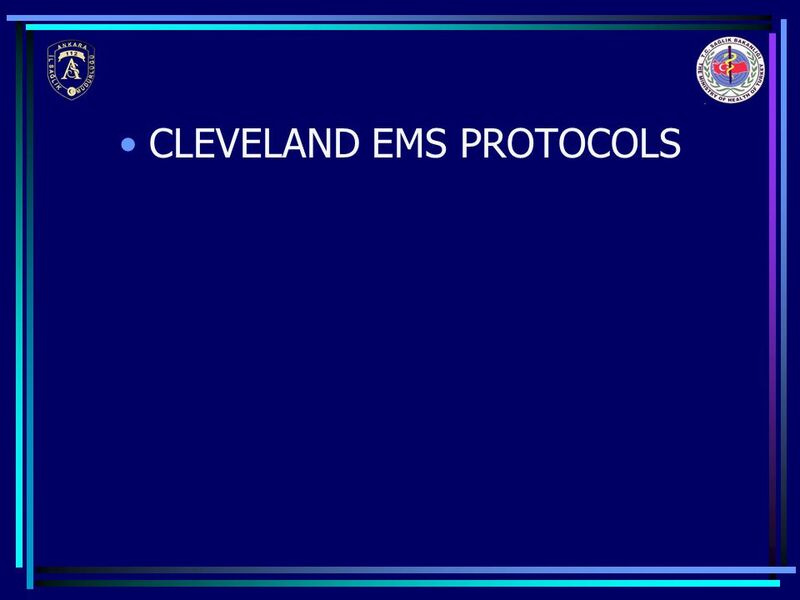 I always get questions about the limited resuscitation that Dr. Maddox has shown in his particular setting, and that may be very worthwhile, but in reality most of us do not have the same kind of EMS system that he has where the patient is deposited in the ER pretty quickly, and that will not be our situation in the field either. 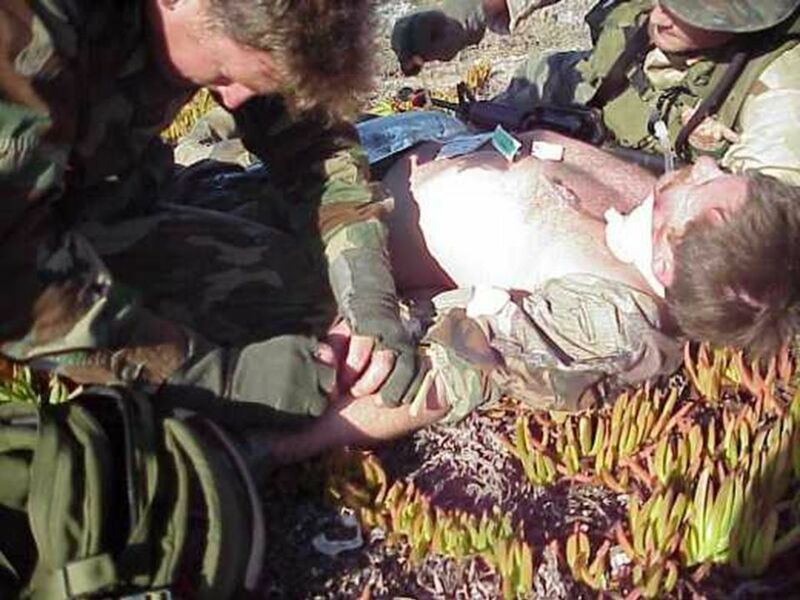 It may take them an hour or two to get to you, and not giving them any fluid may not be the best plan in that particular situation, but clearly, on new horizons we are learning that probably the aggressive fluid resuscitation we've done in the past may be a little bit overboard. 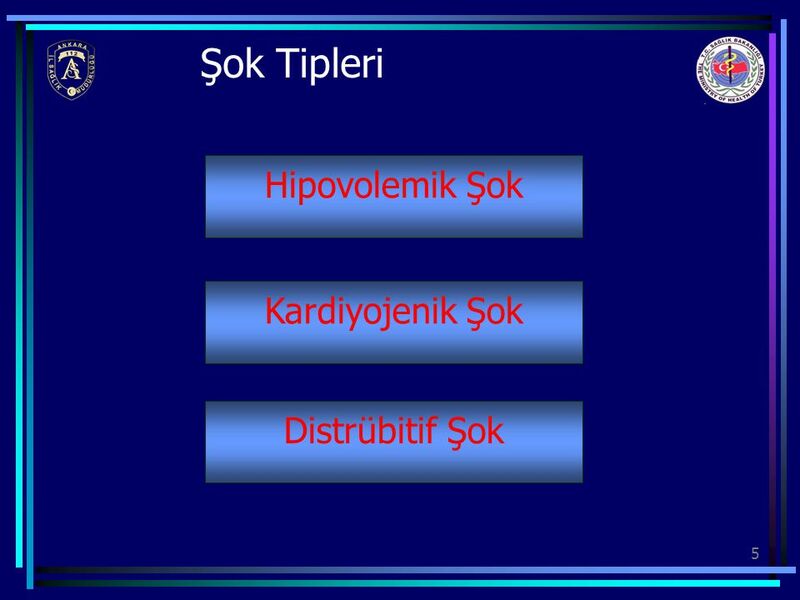 Tipine Uygun ve Crossmatch yapılmış Göz Önüne Alınmalıdır : 2,3-DPG , Trombositopeni, Koagülasyon Defektleri, Potasyum Anormallikleri, Sitrat Toksisitesi, Hipokalsemi, Hipotermi, Enfeksiyon Riskleri Blood transfusions -- Well, obviously if you can autotransfuse blood, if you have that capability, you should do it. 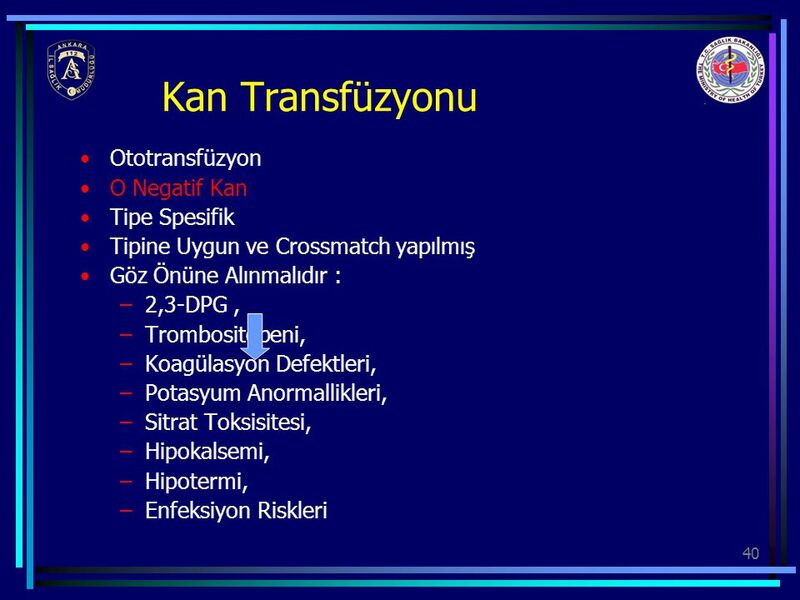 No more than 3 liters of that autotransfused blood should ever be given, because it can lead to significant coagulopathy. O-negative blood, again universal blood type, type specific is ten minutes to get here, type and cross match about an hour to an hour and a half on a bad day around here, which is almost every day. These things obviously are not going to really be available in the field, especially in the forward sites -- very limited blood capability. Things to remember about blood transfusions are the thrombocytopenia from massive transfusions and coagulation defects that exist, the hyperkalemia you can get into with multiple transfusions, hypocalcemia, hypothermia, and all of the infectious risks of blood products. 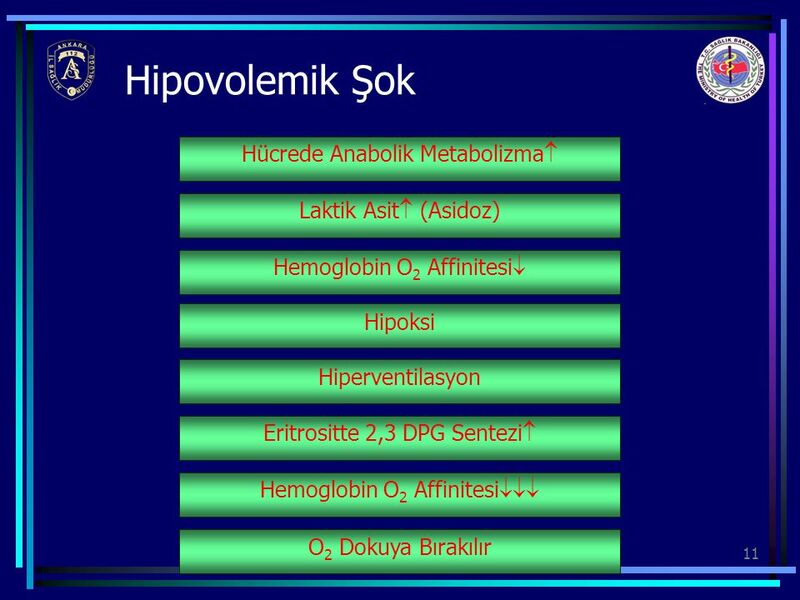 Again, if a patient needs blood and if a patient is in class III shock defined by hypotension, they should get blood. 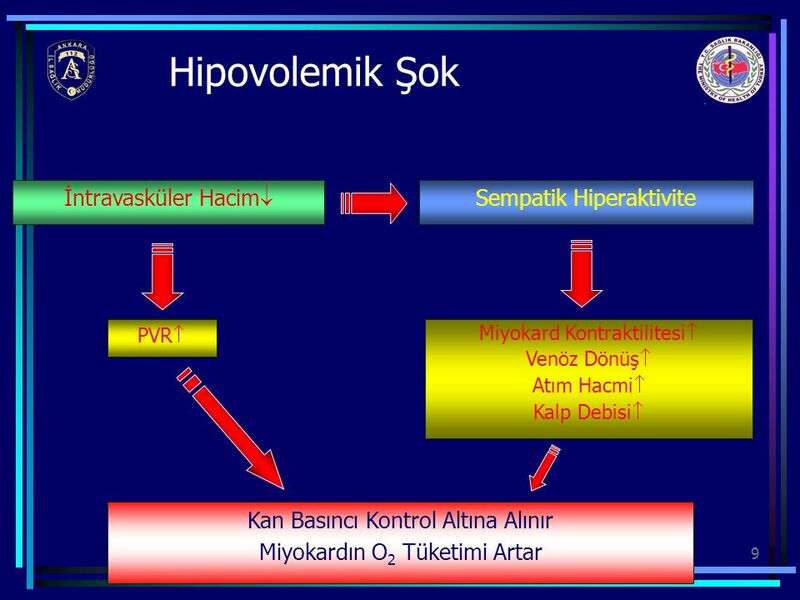 They've lost 30-40% of their blood volume; you're just wasting time and possibly potentiating class IV shock before you treat then effectively, and so that's who gets emergency release blood from most of us downstairs, is obvious hypotension, because we already know where they are. 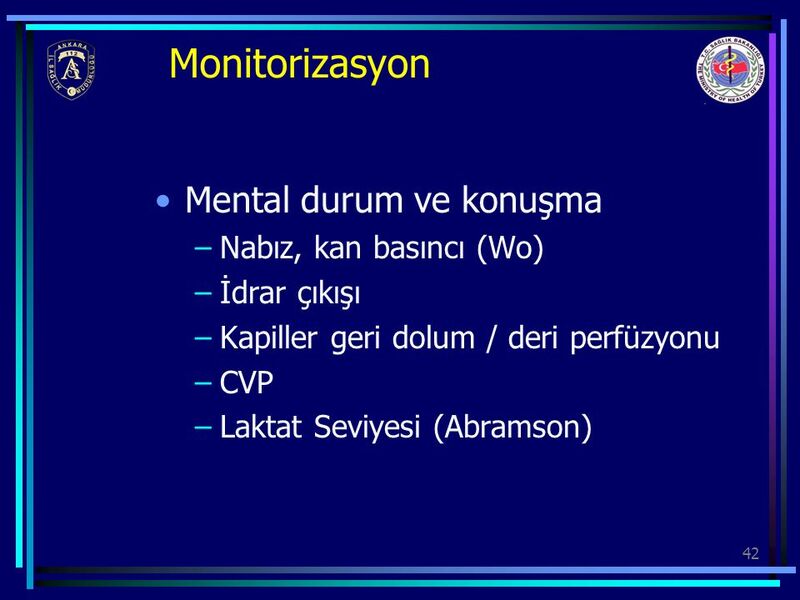 Question: You said not to autotransfuse more than 3 units? 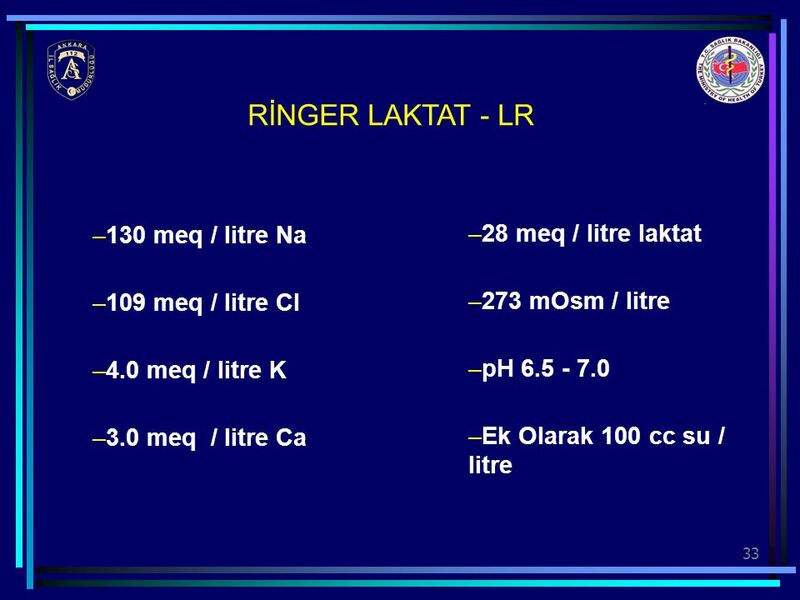 Dr. Mueller: Three liters -- either from your chest tube evacuation or Cell Saver's. It is not recommended you ever give back more than 3 liters of that autotransfusable blood. 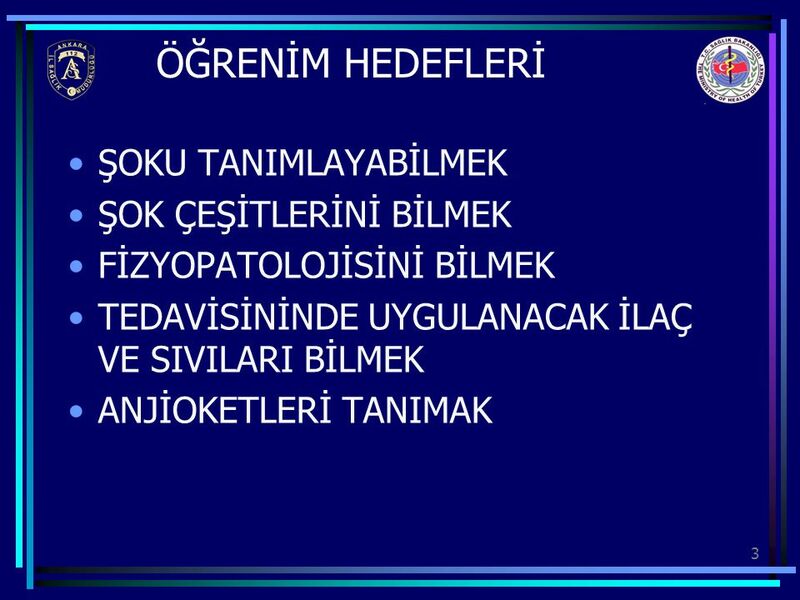 41 Ne Zamana Kadar ? 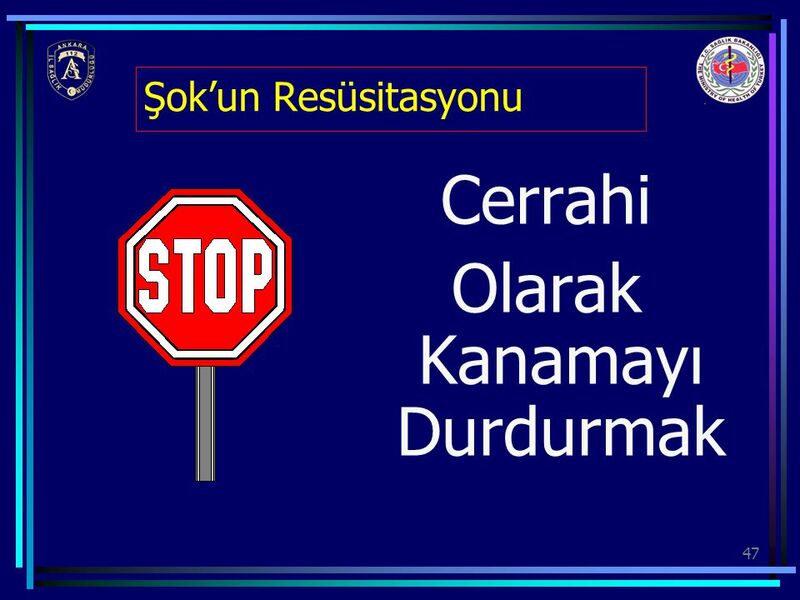 Şok’un Resüsitasyonu Cerrahi Olarak Kanamayı Durdurmak The most important thing in treating shock is to stop the bleeding. 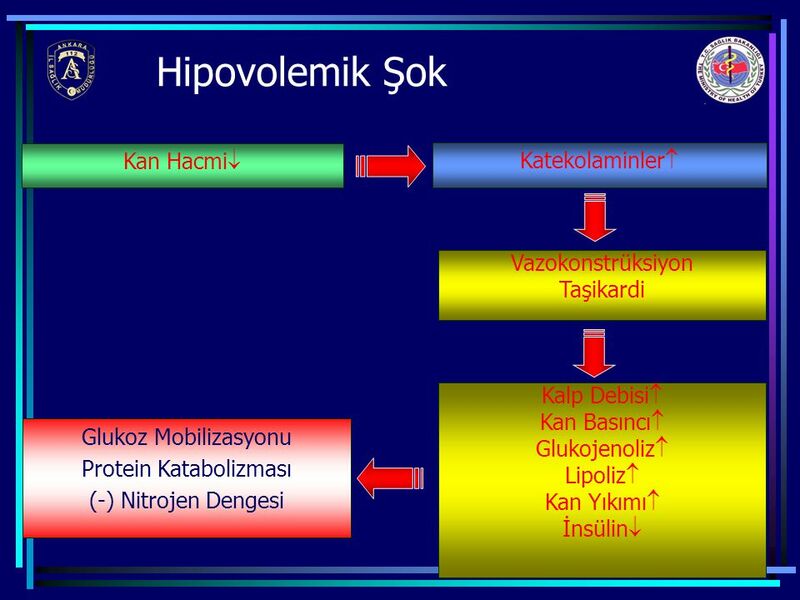 Sodyum Dengesi Yetişkinlerde 55 mmol/kg olan toplam sodyum miktarının %30 u kemik yapısında sıkı bağlı bulunmaktadır. 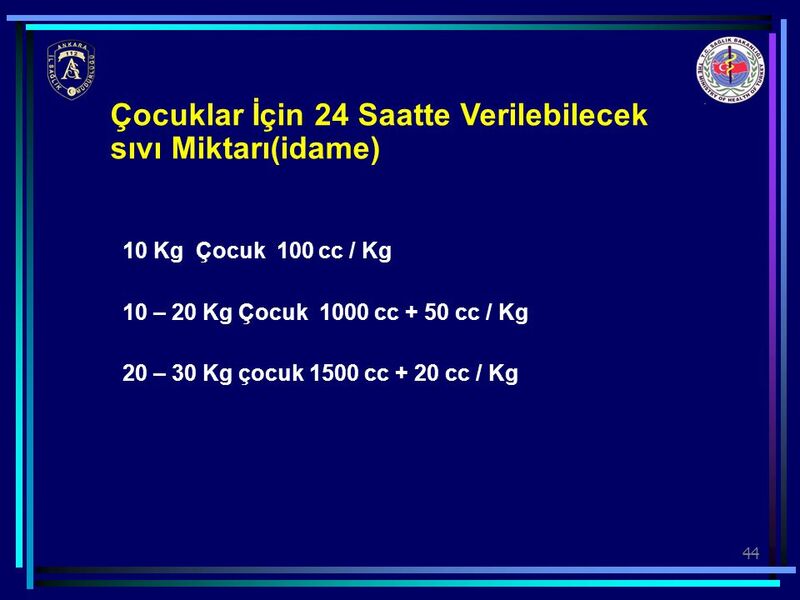 Bu nedenle 40 mEq/kg olan değişebilir.